Also for the year 2019 the Vatican Museums confirm their attention to the residents of Rome by renewing the collaboration agreement with Atac. Exclusively on the occasion of the Night Openings, all Metrebus and èRoma cards holders, accompanied by one guest, may obtain a ticket for their Friday evening visit at the special price of 17.00 €. This special offer, extended to an eventual guest, also entitles visitors to preferential skip the line access to the collections through a reserved entrance, thus avoiding the queue and receiving a copy of the exclusive DVD, “Art and Faith, the Treasures of the Vatican”, an evocative review in images of 2000 years of the history of the Church and art. 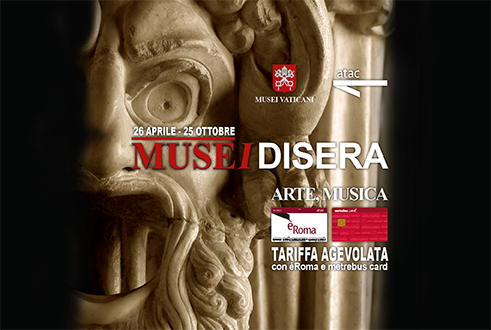 The initiative, valid until 25 October 2019 every Friday from 7 to 11 p.m. (last entry 9.30 p.m.), is intended to make Roman users of the city public transport system aware that they can enjoy the inestimable treasures of the Vatican Museums at the end of the day and in less crowded conditions. It is therefore an invitation extended to all those who are too busy during the normal opening hours due to work or family commitments, so that they may finally re-appropriate their Museum, experiencing and enjoying it in an unusual and special atmosphere. The areas that may be visited during the special night openings are: the Gregorian Egyptian Museum, the Pio Clementino Museum, the Upper Galleries (Candelabra, Tapestries and Geographical Maps), the Raphael Rooms, the Borgia Apartment, the Collection of Contemporary Art and, naturally, the Sistine Chapel. It will also be possible to make an exceptional visit to the St. Pius V rooms, which house medieval and Renaissance ceramics and miniature mosaics, in vogue in Rome at the end of the eighteenth century to decorate small objects.